United Airlines inadvertently entered a public relations storm on Twitter this week that few companies could have come out of unscathed. People were enraged about passenger dress standards and the airline was left trying to pick up the pieces with its pants down. In case you didn’t hear about it, United was accused of not letting passengers fly because they were wearing leggings. It all started when Twitter user @shannonrwatts witnessed a group of girls not being allowed to board because they were wearing leggings and made a tweet about it. 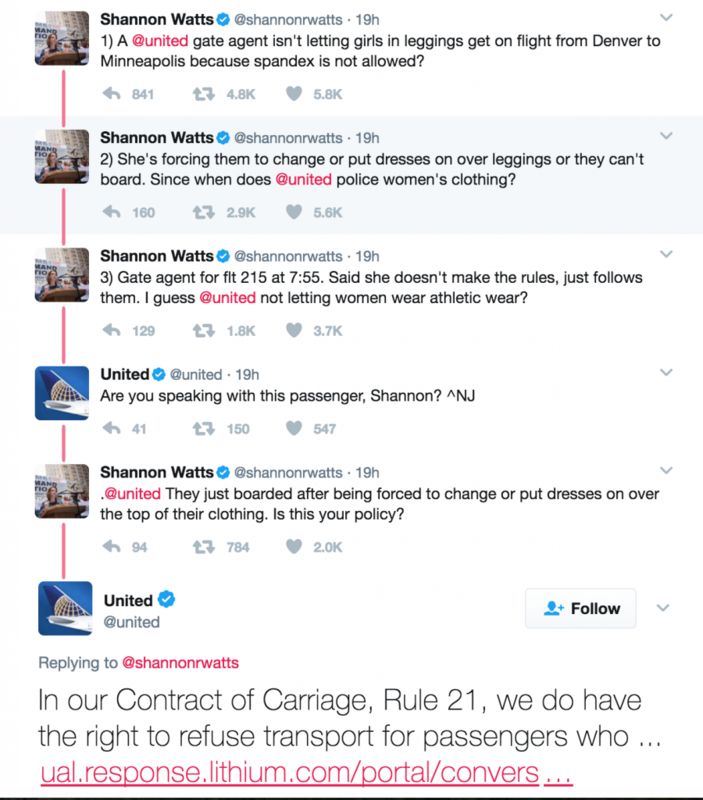 It quickly went viral when United responded with their Contract of Carriage, pointing out they had the right to refuse travel to anyone “not properly clothed”. Given how popular leggings are with female travellers, people were naturally concerned about how far the rule went. What transpired was less black and white. Two of the girls, both teenagers, were asked by the gate agent to change out of their leggings because they were traveling on staff passes that have dress codes. These rules don’t apply to regular paying passengers. The other girl in question, a ten-year-old child, may not have even been asked by United to change out of her leggings. United stated yesterday that her family may have confused instructions given to two teenage girls ahead of them in the queue. At the time of writing this it’s still not clear whether she was asked or not. Regardless of who did what, United’s decision to reply with their dress code policy for standard passengers created unnecessary confusion about whether the airline was policing pants. To add fuel to the fire, United appeared to ignore the fact that at the centre of this fiasco was a 10-year-old child. Twitter’s view was simple: What right did United have to question or restrict what a child wears? Even if the child was traveling on a pass that had a dress code, any policy that applies to adults should surely reflect the needs of children, unless safety is concerned (for example, suitable footwear). United’s social media team didn’t grasp the severity of allegedly asking a child to cover up. Airlines need to understand the world in which they operate so they can predict the types of posts that might blow up into big issues. 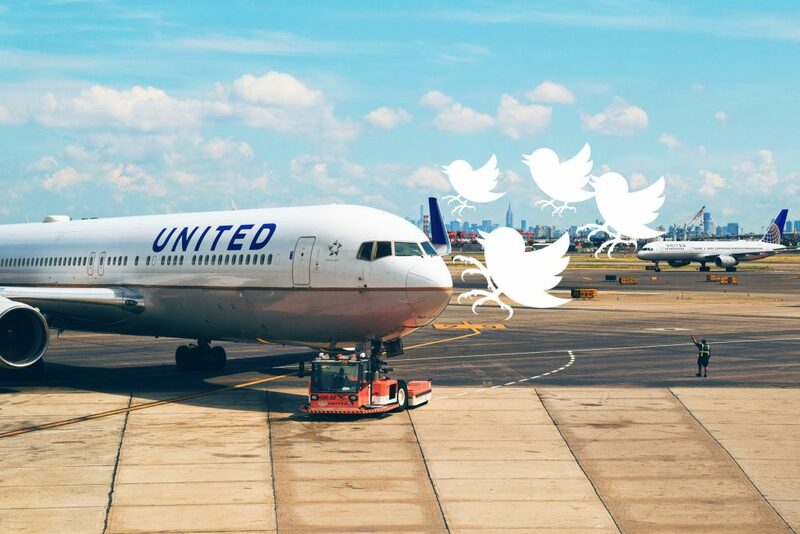 As each angry tweet made its way into United’s timeline the airline responded with links to policies and argued that nothing untoward had happened. Had the airline read the virtual faces of their customers, alarm bells would have rung. Twitter was in a frenzy and no matter how right the airline may have been on paper, customers were either confused about their policies or found them to be out of touch with current standards. People working in aviation follow policy for good reason: lives often depend on it. However, United’s blind faith in policy here was at direct odds with one of the aviation industry’s best traits: the relentless pursuit of improvement. If you find something that is broken, you fix it. Especially policy. Many will argue that United was within their right to do what they did at the gate because that’s how it’s always been done. That’s correct, but it doesn’t mean the rules aren’t immune to criticism or refinement. Airlines (or any organisation using social media) need to understand the world in which they operate so they can predict the types of posts that might blow up into big issues. It’s clear in this case that United had no inkling of how the actions allegedly taken by staff would be perceived as sexist or sexualising behaviour. While this was not United’s intention, their actions, policies and tweets aren’t executed in isolation. They do so under the watchful eye of their customers, community and the rest of social media, and therefore need to respect the climate in which they operate. Corporate social media teams also need permission to back down, even when policy says they are right. Teams can’t always be three steps ahead of social media users. However, being respectful of their customers’ views, acknowledging mistakes and admitting internally that something bigger is at play can speed up a resolution when things do go wrong. When United says that travellers on passes represent United when they fly, they should not forget that their staff on Twitter also do the same on a much larger scale. 0 Comments on "United Airlines social media disaster shows it’s time for brands to think beyond the office"